It is now December 7, 2018. A little more than five years since the interview in question. 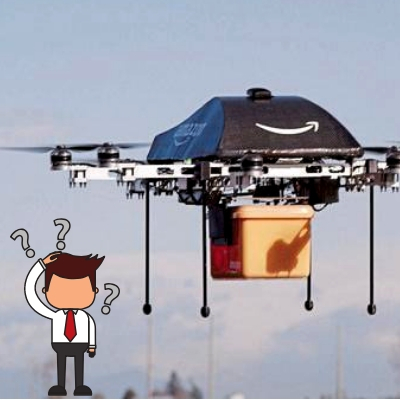 And Amazon has not made a single delivery using an unmanned aerial vehicle. In fairness, the company has made a few public steps towards making drone delivery a reality. In 2016, Amazon started testing drones at a UK site outside of Cambridge, using custom-built GPS-functional octocopters flying at a height of 400 feet. And in 2017, the company filed a patent for a system wherein drones would capture data by scanning the inside of peoples’ homes, a very normal and not-at-all-dystopian thing for a giant, ethically dubious megacorporation to file a patent for. And though there’s been little talk of drones this year, the company has stated it’s still heavily invested in the project. 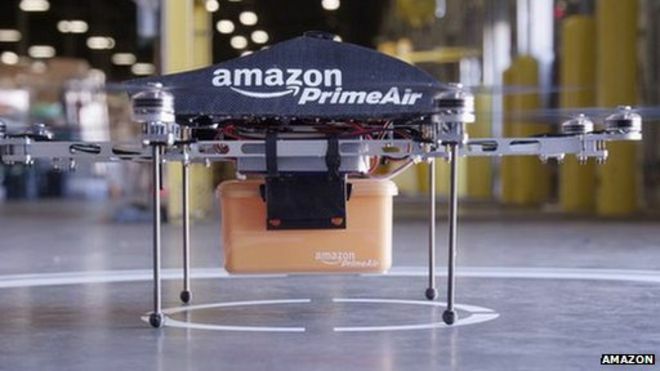 “We are committed to making our goal of delivering packages by drones in 30 minutes or less a reality,” Amazon spokeswoman Kristen Kish told the Associated Press earlier this week. Notably, Kish refused to give a concrete timeline for when the drones themselves might materialize. So what happened? Most likely, the quadcopter technology already exists to start carrying out drone deliveries. Heavy lift drones, including the types of octacopters Amazon was reportedly interested in, are now common and relatively inexpensive in the enterprise drone market. These devices are more than powerful enough to carry packages. However, there are infrastructure concerns beyond Amazon’s control that Bezos likely didn’t take into account. German delivery company DHL Express recently tested drones for delivery purposes and found that they had to be recharged once every two hours, which lines up with similar numbers we’ve reported in the past. There are three ways to deal with this problem. The first is to have a prohibitively enormous drone fleet – one large enough for a drone to make a delivery or two and then charge while another takes its place. At this point, this option is so impractical that it can essentially be considered impossible. Even if Amazon could somehow afford that many drones, airspace restrictions in the US and UK at this current time would never allow that many octacopters flying over peoples’ heads. In fact, in the US, it’s technically illegal to fly a commercial drone directly overhead any person, which would become an inevitability with a fleet this large. The second solution is to increase battery life. This is the biggest technological hurdle currently faced by drone delivery programs (and, one could argue, drone technology in general.) The amount of power required to fly a drone and the size and weight limits on the batteries they carry mean that even that two hour flight time is an extreme rarity – and we don’t really know of a good way to boost that power at the present time. The third solution, and the one most likely to be implemented, is to create more drone infrastructure. This is the approach taken by technologically innovative cities like Dubai and Singapore, and which we are starting to see replicated by private industry in the United Kingdom and parts of the US. This infrastructure would most take the form of wireless chargers and drone ports, which would give Amazon’s fleet a place to “rest” and recharge in small amounts in between large deliveries. Before drone delivery can become viable, nations must make a path for drone infrastructure. This is largely beyond Amazon’s control, so even if they have been putting all their resources into creating the “Prime Air” delivery system promised by Bezos, mass delivery may still be several years away from becoming a reality. Note also that the former point is very much in question. Bezos’ appearance on 60 Minutes was essentially a glorified advertisement for Amazon, and while drone delivery is a technologically innovative and exciting marketing bullet point, there’s little to recommend it over traditional delivery methods at this time, especially when one considers the massive cost involved. Remember: we’ve heard of exactly two steps Amazon has taken towards making Prime Air a reality, and one of them was a patent for a scanner. It’s possible they’re keeping all their research under wraps, but it’s also possible that there’s not much research to keep secret. Speculation aside, it’s clear that Amazon has no plans of launching a drone delivery service in 2018 like Bezos initially promised. Another tech giant, Uber, said in October that they planned to have a drone food delivery service up and running by 2021. Maybe that promise will turn out to be true…or maybe we’ll be writing another article just like this one three years from now.